“What’s in a name?” Or should the question be better phrased, “What’s in your name?” Does your first name mean noble, friend, or wolf? Does your family name give a hint of where your ancestors came from, their background, or perhaps profession. Have some fun finding out what your first name means, and where it comes from. But why not take it a step further, find out what your family and ancestors names mean? Create a chart showing the different names and their history. The first and last name meaning and origin search page from Ancestry.com is a great place to find the meaning of both your first and last name and has good collection of names. Behind the Name will tell you the different languages the name is used in, other scripts such as Greek, pronunciation in different languages and a history of the name. You can also view the popularity of names throughout the decades. Namespedia is another resource you can use as well, and of course, you can try one of the Baby Name sites such as http://www.babynamesworld.com. Find out what the various surnames in your family tree mean, and write a short description about how the surname relates to the family. Were your family members smiths, miners, farmers, etc. and is that how they received their surnames? Did your ancestors take on as a surname the place that they hailed from? Create a list of your direct ancestry line and write the names and the meaning of the names. You even might want to add the year the name was given to your ancestor (most likely the year of birth) and note if the name and meaning have any connection with the year or the times. For example, does your ancestor’s name mean “born in adversity” and was it really so based on what you know of the era in which he or she was born? Write the origin of the names and include each meaning in the file or history about your ancestor. Write a paragraph or two about your ancestor and the name given to them. Was the name a family name handed down? Was the name unique or new to the family, and how does the meaning of the name relate to the ancestor’s life or the life of his or her parents at the time the name was given. Create a family tree chart with the meanings of your names. Some names lend themselves to having short meanings, while others have long definitions. You can probably find a short one or two word description/meaning statement for each name. Put those on a chart for the family. 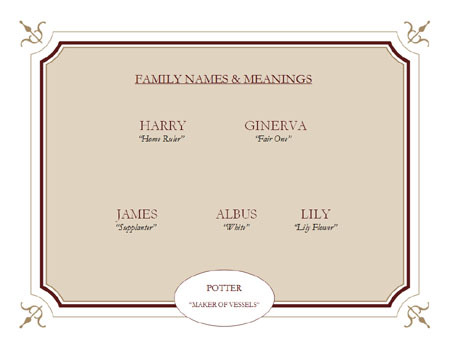 Below is a chart for the Harry Potter family. If you would like to download free family name templates, click here. It is fun to find out the meanings of names, but what may be even more interesting (if you can get the information) is why a certain name was given. Start with yourself and ask your parents, or family who might know, the reason why you were given the name you have. Research your family tree and try to find why your ancestors were given the names they have. Perhaps they were named after an uncle or an aunt, a grandpa or grandma. Sometimes one name was used in a family more than once if a child died as an infant, the name given to that child may have been used for another child. Is there a particular story around why the name was given? Some can be quite funny, so check and see if you can find out why you and your family members were given certain names. So What’s in Your Name? When an author names his or her book, a considerable amount of work and thought go into selecting a title that will be appropriate. Your name (and the name of your ancestors) may have been selected for no other reason than that the names sounded nice, but don’t be too disappointed because it’s more important what you do with your name than why it was given or what it means. That’s your thought for the day.